Pescara Calcio proudly represents its region, as the only team from Abruzzo to have reached the top league in Italian football. The club's story has been told over 80 years filled with incident and emotion, the beating heart of the community which unites people in a unique spirit of belonging. Like all sports clubs, Pescara Calcio has gone through highs (such as the record-breaking season under Zeman) and lows, but thanks to the intervention of a group of local businessmen, led by Giuseppe De Cecco and Daniele Sebastiani, Pescara has managed once again to be a major player in Italian football. The hard work has paid off, so much so that today Il Delfino is now considered to be one of the most respectable clubs in Italy, with careful planning for the future both from a sporting and infrastructure point of view. The club now wants to continue its journey through the Pescara Bond which represents a new chapter for Pescara Calcio. "Since becoming president, I have focused on two main objectives: first, to bring stability and sustainability to the football club, through careful management of the company activities in all areas, both on the sporting and administrative sides. The second concerns the club's long-term future, paying particular attention to the youth academy, scouting and infrastructure. This is why I would like to embark on this journey together with our fans – to develop the facilities to allow the club to grow, and to enable the fans greater access and involvement in the club’s activities in a space that is for their enjoyment too. Of course, the whole club and I believe this important, innovative and engaging project will be a huge success, and I invite you to participate in this new undertaking with the confidence we will deliver a result of which we will all be deeply proud!" Innovation and the pursuit of excellence: these are the values guiding Pescara Calcio’s infrastructure development project to improve and expand its training facilities with the objective of creating a state-of-the-art sporting centre, a modern hub for our athletes, staff, fans and the whole community. Building top-class facilities not only for the first team but for everyone in the club is a fundamental part of what makes a quality professional set-up. By investing in infrastructure, Pescara will be able to improve its short-term performance as well as allowing the club to bring to life its plans for the future – including the scouting and youth development programmes, which have always been a source of strength at Pescara. “We have made the decision to embark on this critical phase of growth, investing in our sports infrastructure, to help us to make a significant jump in quality"
Following the initial investment already made into the training centre and scouting programmes, we want to continue the journey with a new chapter to bring about further growth for the club. 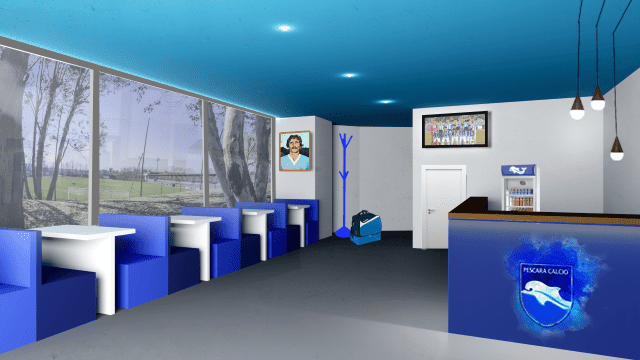 Through the Pescara Bond, anyone can invest in the development and renovation of the Delfino Pescara Training Centre, in the future of the Pescara Calcio youth academy and in other areas to benefit players, fans and the whole community. 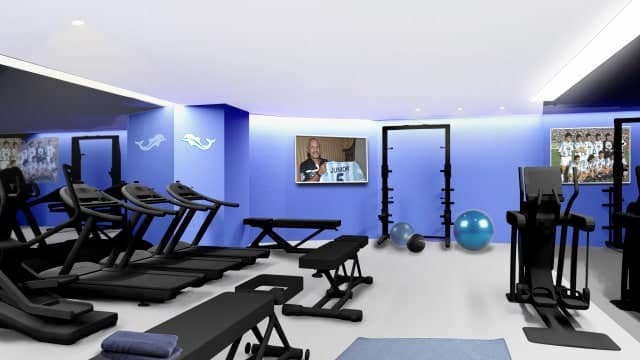 Changing Rooms & Gym Facilities. These areas will be modernized with the construction of a new swimming pool. Football Pitches. Renovation of our existing facilities as well as the creation of two new grass pitches. Hub Building. A fully equipped new main structure, with dining facilities, a recreation room, a press room and a new home for Pescara's administrative offices. Multi-Sport Facilities Open to the Public. Includes a mountain biking trail, three paddle courts and a swimming pool. Youth Academy Campus. A new structure with accommodation facilities, a dining room, a multimedia room, a relaxation room and classrooms. Scouting. A fundamental element for any football clubs to secure their footballing and financial health. Want to know more? For more details on the Academy investment, and to find out what you could receive from investment in the Pescara Bond, simply click the Learn More & Invest button above to read on. Pescara Calcio believes that investment in modern and innovative infrastructure will help to strengthen Pescara's long-term on-pitch results and provide value to the wider community. For Pescara, the youth academy is one of the most critical ingredients for delivering results on the pitch: this is demonstrated by the potential shown by our current crop of youngsters such as Mirko Antonucci and Gaetano Monachello, as well as the likes of Edgar Elizalde and Francesco Galante who both broke into the First Team last season. Pescara Calcio is one of a few Italian clubs to deliver consistent profits, thanks to excellent financial planning and management. Bondholders will receive an annual interest of 8% per annum (made up of 5% cash and 3% in club credit) and at the end of the 5 years the investor’s principal will be returned. Since the current President Daniele Sebastiani has been at the helm, Pescara has achieved 2 promotions in Serie A in 5 years, an unprecedented result in the history of Pescara. In the event that Pescara are promoted to Serie A during the term of the bond, investors will receive a 25% Promotion Bonus on their investment. Each investor will have access to exclusive privileges. These privileges increase depending on amount invested. This campaign is now closed for investments. What are the characteristics of a bond like the Pescara Bond? It is an innovative and effective way for an unlisted company to raise funds from a non-institutional audience (e.g. general public). Bonds like the Pescara Bond are typically issued at a fixed interest rate over a set period of time (e.g. 5 years). The investor is repaid through interest payments at regular intervals, until the maturity of the bond at which point the initial investment (principal) is repaid. Who is issuing the Pescara Bond? The Pescara Bond is issued by Delfino Pescara 1936 Finance plc, a public limited company incorporated in England and Wales with registered number 11530555 and with its registered office c/o Legalinx Limited, One Fetter Lane, London, United Kingdom, EC4A 1BR. Who can invest in the Pescara Bond? Any individual of at least 18 years of age or a company or charity that satisfies the conditions of Application and completes the Appropriateness Questionnaire can invest in the Pescara Bond. Tifosy does not advertise investment opportunities to people in the United States, Canada, Australia, Japan or any other country where it would be unlawful for our capital raises to be advertised. Investors must not register or view details or key documentation if they are resident in these countries. How many Pescara Bonds can I apply for? The minimum amount of Pescara Bonds for which you can apply is €500. You can, subject to availability, apply for as many Pescara Bonds as you wish, in increments of €500. Can companies invest in the Pescara Bond? Yes, in the ‘Personal Data’ section, just select ‘on behalf of a company’ and proceed with the application. How much is being raised? The target is to raise €3,000,000 by the issue of the Pescara Bond. The Pescara Bond may be issued when the minimum investment threshold of €2,000,000 has been reached. In order to satisfy demand, up to €6,000,000 of Pescara Bonds in total may be issued. What happens if the minimum investment threshold is not reached? Should the minimum threshold of €2,000,000 not be reached, the Pescara Bond will not be issued, and monies will be returned to investors. What happens if the €3,000,000 target is not reached? Should the minimum threshold of €2,000,000 be reached but funds fall short of the target of €3,000,000, the Club will issue the Pescara Bond, and will look into further funding options to cover the shortfall. The Club has undertaken to continue with the planned developments regardless of the outcome of the Bond issuance. The Pescara Bond will yield a fixed return on your initial investment of 8% (gross) per annum comprised of 5% in cash and 3% in Club Credit. Interest is paid annually. In the event that the Club is promoted to Serie A you will also be paid a one-off promotion bonus of 25% (gross) on your initial investment. How does the one-off Promotion Bonus work? The Pescara Bond will pay a one-off promotion bonus of 25% in the event that the Club is promoted to Serie A during the 5 year initial term of the Pescara Bond. This bonus will be paid following receipt of the first Serie A payment in the year of promotion. The Promotion Bonus will only be paid a maximum of one time. If the Pescara Bond has been redeemed or the Club is not promoted during the term of the Pescara Bond the Promotion Bonus will be not be paid. Will I be taxed on my returns? If you are a private investor, all interest is subject to withholding tax at 26%. This amount will be withheld at source and paid to the tax authority on your behalf. It is your responsibility to report the interest on your tax return as appropriate and pay or reclaim any tax that may be due. Can I pay by instalments or top up my holding of Pescara Bonds at a later date? No, unfortunately you will not be able to pay for your Pescara Bonds in instalments, nor can they be topped up at a later date. All Applications must be accompanied by an online payment or bank transfer for the full amount of Pescara Bonds applied for. When can I invest until? The application period will be open until 23:59 (UK time) on Friday 16th November 2018. However, if the demand is very high and applications for the full amount of bonds issued come before that date, the application period may close early. Yes, there is a cooling-off period of 14 days, which begins on the date your completed Application has been received. You have the option to cancel your investment within this period by emailing pescara@tifosy.com, in which case your money will be returned and no interest will be payable. After 14 days, your Application will be irrevocable and will not be capable of being terminated or rescinded by you. Are the Pescara Bonds transferable? While the Pescara Bonds are transferable to other members of the Tifosy website, there is no formal secondary market in place, the Pescara Bond is not listed and investors should assume they will need to hold it for the full term. Please refer to the Tifosy Investor Terms for more information on transferring Pescara Bonds. What do I need to do before deciding whether to invest? You should read the documentation in full, including the Invitation Document, the Bond Instrument document, and the Q&A document, and make sure you fully understand the risks involved. Click "Invest Now" to submit an application through the Pescara page on the Tifosy platform. Do I need to discuss an investment in the Pescara Bond with a financial advisor? Yes, you are strongly recommended to seek the advice of an independent financial advisor. Where can I receive additional support or request more information? Call +44 (0)20 7349 0622 between 10am and 6pm. Email pescara@tifosy.com to ask any question, or to request a call back. Use the Live Chat box on the investment page between 10am and 6pm. Investment in an unquoted security of this nature, being an illiquid investment, is speculative involving a degree of risk. This investment is unsecured, is not covered by the Financial Services Compensation Scheme (or any other compensation scheme) and carries risks to your capital. Before investing please read the Offering Document in full including the Disclaimer and Risk Factors. By investing you agree to the terms and conditions in the Invitation Document and the Tifosy Investor Terms.